All in one houseplant care – feeds and protects. Houseplant Defender allows you to specifically target the infested area to protect your houseplants from bugs while at the same time nourishing the plant to promote strong and healthy growth. Child, pet and bee safe, ecofective Houseplant Defender is a ready to use pesticide free spray which gives excellent control of pest species including whitefly, aphid, red spider mite, mealybug, scale and psyllid. Ideal for edible and ornamental plants, the formula works by physical mode of action and contains a blend of surfactants which stop the pests from moving and being able to feed. Safe to be used around children and pets, ecofective Houseplant Defender also helps to control, with regular use, powdery mildew by physically washing the foliage to remove active mildew spores. Simply apply to the upper and lower leaf weekly to keep full control of bugs. The formula also provides foliar nourishment to encourage healthy vibrant houseplants and stimulate the development of more flowers. There is no harvest interval required, meaning the produce can be eaten within hours after application - edibles like tomato plants can be picked straight away - just simply wash the fruit or vegetables before eating. 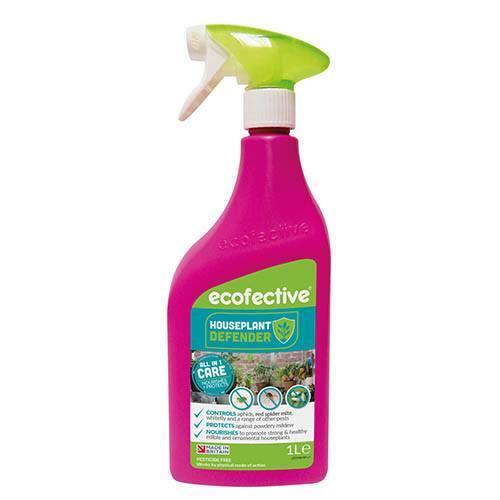 ecofective Houseplant Defender is perfect for indoor plants, but can also be used on ornamental and edible crops, including flowers, shrubs, fruit and vegetables. Due to the physical mode of action these pests will not become resistant to ecofective Houseplant Defender. Apply early morning or late evening. Always move plants off of window sills, and away from direct sunlight when applying Houseplant Defender to avoid scorching. Always do a test before full application to ensure the plant can withstand the application. Do not apply in full sun as this may risk scorching of the plant. Shake well before use, turn nozzle to the ‘ON’ position and apply thoroughly to upper and lower leaf surfaces. Re-apply every week to keep full control of the pests. When finished applying turn nozzle back to the ‘OFF’ position.